Today I'm sharing a simple winter to spring outfit that is flattering and easy to recreate! This Pleione roll sleeve tunic is my absolute favorite!! The material is light yet soft and I love the tunic length. By the way, it's not maternity but works perfectly for my growing bump! This tunic comes in a bunch of colors and is on sale right now for $35.40 (plus free shipping). For reference, I'm wearing a small and my color is purple nectar. For this outfit, I went with my LOFT ponte leggings for bottoms. 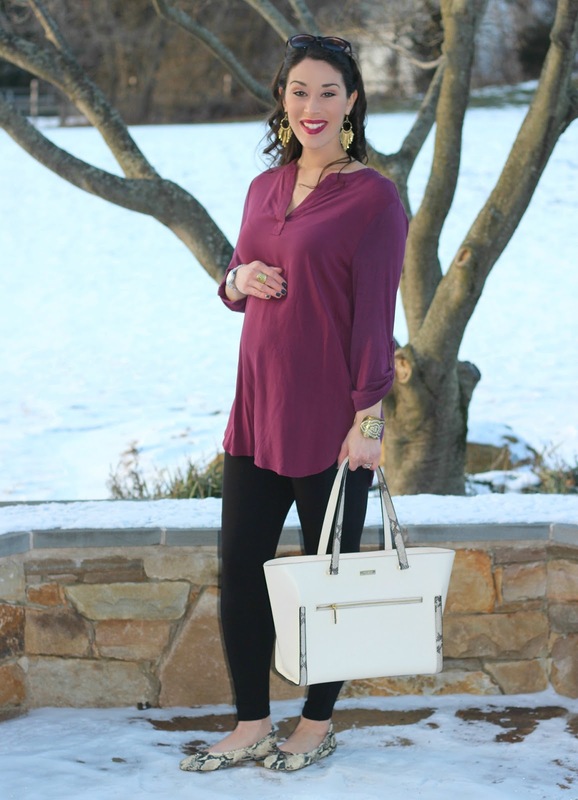 Unfortunately, my days in these leggings are coming to an end...they aren't super maternity friendly! LOL. They are my favorite leggings though (I wear them a lot on here! ), so I will be looking for a similar maternity pair asap! I can't recommend these leggings enough...they are thicker than a regular legging and much more flattering. They are full price right now, but LOFT runs sales quite often, so keep an eye out! Here's a look at the length of the tunic from the back...definitely long enough for leggings but looks super cute with jeans, too! I carried my Kate Spade Cement/Natural Snake Tote to coordinate with my snakeskin flats. I try not to be matchy matchy, but this was too perfect not to put together! Plus, I love how the off white bag stands out against the black and plum. It's fun and unexpected to carry a white bag during the wintertime! I purchased these Sam Edelman 'Felicia' Flats on sale during the Nordstrom holiday shopping party. My friend raved about them and swore they were the comfiest flats EVER. She was right!! As soon as I tried them on, I completely agreed! They are way more supportive than other flats I've owned and they feel like slippers on my feet! This 'Felicia' flat comes in TONS of solid colors (suede and leather), as well as this snake skin and a leopard print (regular price). Most of these flats (including mine) are 30% off right now! This gorgeous brass jewelry is from Hazel & Deene. 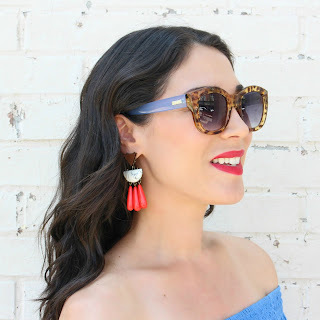 I've worn several of their pieces on my blog before, so you may recognize the name! This company is awesome...they work with women in India by providing them with fair trade opportunities. All the jewelry is hand made by these women and their collections are SO PRETTY. I love supporting companies with a mission! My earrings are the Ophelia Earrings and bracelet is Esperanza Cuff. Be sure to check them out! Love that tunic and color on you. Gorgeous flats by the way. Can't wait to hear the news about the gender!! Those flats look great & you can't beat comfy! Oh and that tunic looks great on you. Such a cute baby bump. Love this outfit! SO glad you love your Felicia Flats! Thanks!! Yes, they are so comfy! I know your are excited about finding out the gender! You look so pretty in your top and I love your shoes!